Diaa Bekheet | Washington, DC – The Yellowjackets Quartet is one of the most popular modern jazz bands in America. The group just released its new album “Timeline” to celebrate 30 years of achievements as one of the premiere jazz fusion/smooth jazz groups of our time. 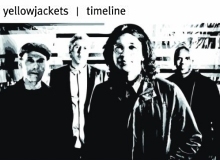 The Yellowjackets have recorded 24 albums, so far. The quartet is currently made up of Russell Ferrante on keyboards and synthesizers, Jimmy Haslip on bass, Will Kennedy on drums and percussions, and Bob Mintzer on saxophones and bass clarinet. And the second was for Best Jazz Fusion Performance for “Politics” in 1988. THANK YOU, THANK YOU, THANK YOU!!!!!! Now when are you coming back to New York? great music will live forever!